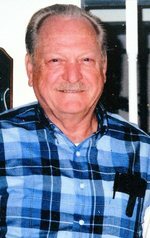 Obituary for Charles L. "Chuck" Kiser Jr.
Charles L. "Chuck" Kiser, Jr., 86, of South Charleston, formerly of Elkview, a loving husband and father, passed away Monday, September 11, 2017 at Thomas Memorial Hospital, South Charleston. He was a retired auto body repairman with Moses Cadillac and served his country in the US Air Force. Charles was a member of the Antioch Advent Christian Church, Aaron's Fork. He enjoyed hunting, fishing and gardening. Charles was preceded in death by his loving wife, of 48 years, Velma Reed Kiser. Surviving are sons, Jeff (Kitty) Kiser and Joseph Kiser; brothers, James Kiser, Dale Kiser, Bob Kiser, and Ronnie Kiser; sisters, Doris Cook and Shirley Rucker. Service will be 11:00 am Friday, September 15, 2017 at the Hafer Funeral Home with Pastor Nahum Balser. Burial will be in the Gandeeville Cemetery, Gandeeville. Visitation will be from 6pm-8pm Thursday, September 14, 2017 at the funeral home. To send flowers to the family of Charles L. "Chuck" Kiser Jr., please visit our Heartfelt Sympathies Store.